Most bands would be envious of the subdudes’ lot in life. After all, many struggle and fail in their bids to reach the top of the mountain once, let alone twice. Although the subdudes suffered an acrimonious breakup that lasted for six years, the group has spent its time, since its reunion in 2002, re-establishing itself within a marketplace that has grown considerably more crowded. Its latest set Live at the Rams’ Head combined with its complementary documentary Unplugged at Pleasant Plains couldn’t have been issued at a better time, either. Not only do these efforts sufficiently serve as a superb reintroduction to the subdudes’ exquisite canon, but they also have helped the outfit to take the final steps it needed to come full-circle and bring Flower Petals, its ambitious new studio album, to fruition. "Last year, we were starting to book tour dates for the fall, and we started thinking that maybe we should do it differently," explained John Magnie, the group’s keyboard player and accordionist. "The natural thing to do was to go back to this acoustic style, which is how we started the subdudes, the first night in ’87, down in Tipitina’s," he continued. "We had merged into something else over all these years by adding electric guitar, keyboard, and amps. Now, we’ve gone back to this." "Well, we never sat down before," he corrected himself. "But, now, we’re sitting on five chairs. Just two acoustic guitars and bass, I’m on accordion, and Steve [Amedée] is doing his tambourine thing, which always amazes people because of how he gets a whole trap set out of the instrument." "People have been really loving it, and we’ve been really loving it. It seems to have an intimacy to it. It really lets the vocals out, which is a big thing. We like to do a lot of harmony, and we have such a great lead singer in Tommy [Malone]. It just seems to really be reaching people in a more direct way," Magnie stated joyfully. "In addition, with these times of travel being so much more expensive, it’s really helping us out!" he said with a laugh. "We’re just taking an instrument or two each and minimizing it." The musical landscape during the latter half of the 1980s, when the subdudes was formed, wasn’t as vapid as many seem to think. Although the pop charts were littered with throwaway singles and albums from performers who merely looked good in front of a camera, in the back corners of America’s big cities as well as its small towns, a seemingly endless supply of up-and-coming outfits was shrugging off the synthetic superficiality of their surroundings in order to embrace organic, roots-oriented grooves. It was within this burbling cauldron of creativity that the subdudes was born, though, right from the outset, the collective already had a rich and vibrant history. After all, Magnie had been working with Malone in New Orleans for quite some time. Magnie had been a member of L’il Queenie & the Percolators, and when Sonny Landreth stepped aside, Malone was recruited to take his place. This chance meeting proved to be the genesis of a remarkably fertile partnership. As the Percolators’ lease on life came to an end, The Continental Drifters began to take shape. Between 1984 and 1987, Malone and Magnie brought bass player Johnny Allen into the fold. Still, amidst a wealth of outfits competing for attention in and around New Orleans, the group struggled to make ends meet. "We had really been knocking around New Orleans for a long time, and the city is so rich with music, it’s really easy to get overlooked," Magnie reminisced, albeit with hints of resignation and frustration in his voice. Although it had a roots-oriented underbelly, The Continental Drifters was a tried-and-true bar band that performed with its amps cranked to 11. Everything the outfit did was boisterous, and there was no subtlety to its style at all. "My wife and a couple of girlfriends told us after this gig at a place called Jimmy’s in New Orleans, ‘You’re just too loud. We can’t even hear what you’re singing about,’" Magnie explained. Magnie’s and Malone’s first instincts were to react negatively to the suggestion. Nevertheless, they agreed to do one show as an acoustic act. Percussionist Steve Amedée joined the core of The Continental Drifters — Malone, Magnie, and Allen — for a show at Tipitina’s, and the subdued atmosphere they were determined to create inevitably leant the new ensemble its name. "That was really where it was born," said Magnie. "It came out of a resentful reaction, in a way, but we knew, even then, that it was a good thing to try." After moving from New Orleans to the less competitive environment of Fort Collins, Colorado, the subdudes enjoyed a wonderfully successful run in the late ’80s and early ’90s. "It just felt really special. Things had really come together with this subdudes idea, and we had to take it somewhere. We thought of New York and L.A., and we ended up halfway in between," explained Magnie. "Basically our aim was to try to make a living playing our original stuff, and making that move spurred a bunch of things to happen." "Within a year, we had a deal with Atlantic Records, and after we got the deal with Atlantic, we bought this old bus — I mean old. It already had I-don’t-know-how-many million miles on it. We ran that thing for three or four years. We had so many great times on it, and so many bad times on it, too. It was always breaking down, you know," he said with a chuckle. After releasing its self-titled debut and Lucky for Atlantic Records, however, the wheels began to fall off the cart. It didn’t help matters that the subdudes’ label grew impatient with the band’s lack of instantaneous success. In what was a sign of things to come for the industry, it pulled back on priming and developing the subdudes’ career, going so far as to undermine the recording sessions the outfit was holding with producer Glyn Johns. By the time the collection was completed, Atlantic Records no longer wanted the subdudes on its roster. It was the beginning of a very difficult time for the outfit. "I think anybody that is part of any family — or anything where you’ve got to work with other people — knows of the problems that are available there. In a band, you have this extra extreme going on where you write these songs, and this music is really personal to you," explained Magnie. "We were writing together, and for a few years, it was great. Then all of a sudden, it just started tailing off. For one thing, I think we wrote all of the songs that we could write, and some of them started sounding like copies of other ones. When the collaboration started to break down, it was like the beginning of the end," he said. "Tommy and Johnny went to another band called Tiny Town out of Nashville," Magnie continued. "That was kind of blamed for being the reason for the breakup of the subdudes, but we really just ran our time." For a while, the members of the subdudes went their separate ways. Despite performing a handful of reunion concerts, no one expected a full-fledged reconciliation to occur. Then again, the subdudes never has been a group that adhered to a grand, master plan. Instead, it thrives on spontaneity. "It’s when we’re at our best. When we try to have a plan, it never seems to go that way anyway," said Magnie. The subdudes consistently has taken its ideas from wherever they might come, allowing fate and the creative gods to serve collectively as its guide. This doesn’t mean that the group ever was content simply to wander through its career without paying much attention to what was happening around it. Yet, the outfit seems to have learned from its mistakes in the mid-’90s when tensions ran high, and its music began to feel forced into place. The other factor that has guided the subdudes throughout the past 22 years is its unwavering refusal to give up. Just as the group’s tenacity led it to move from New Orleans to Denver in order to survive, it also drove it to climb back from the brink of its own dissolution. Each of the albums it has made since reuniting in 2002, from Miracle Mule to Behind the Levee to Street Symphony, has been considerably better than its predecessor, and each time that the subdudes has ventured into the studio, it also has increased the levels of cooperation and collaboration among its members. When he was asked how they managed to set aside their differences, Magnie replied, "Those differences are still there. Either you work with them, or you don’t. I think we just recognized that the whole is more than the sum of the parts. So, you put your strengths together, and try to involve the ego as little as you can." "In a business that is built on ego, it’s always weird," he added with a laugh. "Behind the Levee and Street Symphony came from the music that we sat down and wrote together. Most of those songs were actually written in writing sessions, where incredibly enough, you just gotta say, ‘we’re gonna go sit down and write some songs.’ Dang, if it doesn’t happen a lot of times," Magnie said with amazement. Where Behind the Levee and Street Symphony evolved to become conceptual works, the subdudes’ latest concoction Flower Petals was built around a full-fledged narrative. "We wrote the album right after we did Miracle Mule. The song Flower Petals was a contender for that record, but we decided to write a whole album about what happened in that tune," Magnie stated. "Flower Petals is about some happenings in a little town, set back about 100 years. It has some really standard elements. There’s a love triangle that produces a killing, and the wrong person is blamed for it," he continued. "In all these songs, we were taking on the roles of different characters. In fact, three of them were written as girls. So, we were jumping into this character and writing from inside-out of them," Magnie elaborated. "In the end, there are some redemptive things that happen, such as a wedding. One theme that runs through the album is the building up and releasing of guilt." Once again, though, the subdudes has been experiencing difficulties with its label. "We wrote this thing, and we presented it to our record company. They thought it was too adventurous. They asked us to go write a whole new record. So, we did. That became Behind the Levee," said Magnie. "So, the next time we were about to make a new album, we said, ‘Well, we’d like to do this Flower Petals story-song record,’ and they said, ‘Nah. It’s too risky. 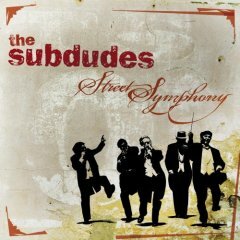 We need another regular subdudes record.’ So, we went and wrote Street Symphony," he continued. "Finally, Flower Petals gets its chance, though it’s probably because we just went ahead and recorded it on our own," he said. Then, with a mischievous laugh, he added, "We’re getting a label after that." "This acoustic thing that we’re doing right now came around as something we wanted to do for the show, for the performance," Magnie said. "Then, it mutated into this Flower Petals album, which has that kind of real, acoustic setup." "We like to think of it as a Led Zeppelin approach to folk. It’s folk music but it’s got a little edge to it," he stated. Where Live at the Rams’ Head and Unplugged at Pleasant Plains provided a sturdy overview of the subdudes’ work, Flower Petals very well could prove to be its magnum opus. Regardless, sitting back and allowing nature to run its course seems to have been the right path for the subdudes to have followed. The band might not have intended to return to its roots, but in the end, it’s where it rediscovered the formula that made its early days so magical. Things might not always have been easy for the subdudes, but as Magnie concluded, "It’s been a good ride." Flower Petals is available from Barnes & Noble.